Before she was a mind-possessing badass who was the first recruitment to Charles Xavier’s new X-men team the New Mutants, X’ian Coy Manh had a tough life. Growing up in Vietnam during the Vietnam War, her mind-control powers manifested when protecting her twin brother Tran Coy Manh from an attack by a Viet Cong soldier. Tran went on to abuse his own identical powers, and Xi’an, along with her mother and younger siblings escaped from Vietnam by boat after her father a South Vietnamese colonel was killed. On the journey she and her mother were sexually assaulted and her mother killed, leaving Karma an orphan and the caretaker of her siblings. This is the state that led her desperately to possess Spider-man’s mind to protect her little brother and sister. After a showdown between her, the mind-controlled Spider-man and the Fantastic Four who were possessed by her evil brother Tran, Xi’an absorbed her brother’s mind completely and became Karma. Later, in a Battle with Cameron Hodge, she was severely injured and had to have her leg amputated. It was replaced with a bionic prosthetic. She’s been a loyal member of the X-men for decades, with brief stints away from the team to pursue other interest, including a job as a librarian at the University of Chicago, where she met and fell in love with Kitty Pryde (currently known as Shadowcat). The two have been close friends, but Karma believes that Kitty would not be able to reciprocate her feelings and so has not pursued her own. Karma has been in no other known romantic relationship. 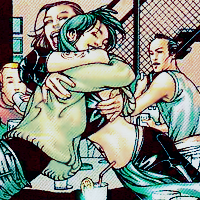 Recently, Kitty had returned the Jean Grey School for Higher Learning, where she has had a casual and undefined relationship with Iceman, and is appearing in Brian Wood and Olivier Coipel‘s X-men series. Love doesn’t always work out for everyone, not even superheroes. Today Karma is a member of the Astonishing X-men team, along with Gambit, Iceman, Northstar, Wolverine, and Cecilia Reyes. Created by Chris Claremont and Frank Miller, Karma first appeared in 1980 in Marvel Team-Up #100. Coming out and confessing her feelings for Kitty in 2003, she was one of the first lesbian characters in a mainstream comic.